Environment: Overcast, very fuzzy moon. Breeze detectable. Equipment: Same gear, the 7.62(22) rifle on the RRS and the 5.56(10.3) carbine. Activity: Setup in the same spot and started 360s. Saw some black spots along the fence on the north side of the alfalfa patch, but it wasn't until the 3rd pass that I figured out they were my cattle bedded down at an average of around 513yds, per the Radius. One rat in the apple orchard at 110yds. Nothing in the West pasture. Nothing on the ridges to the SW, S or SE. And nothing along the creek to the NE, N.
I was having to nuc more than once per 360 at this point. And had to crank up the gain. Two clicks (7) was too much, one click (6) was not enough, so ran it on 7. Still ran brightness starting on 60% and then backed down to 40% on the 3rd 360. I do about 20 360s in an hour. The 360s themselves take about 2 mins, including extra sub-passes for the elevations and adjusting the gain, brightness and nuc-ing. But I also stop and study various areas for longer time periods if i see an OOI (Object Of Interest) and that consumes the rest of the time. I think I'm getting more time behind the UTCx and the Radius this week than I do in an average 1-2 months ! Because I usually take the 5.56(10.3) out for Coop Patrol, where I'm walking around and scanning. Heard a batch of yotes to the NE, at over a mile away. Sound carries well at night, even when there is a fair amount of water in the air as there is tonight. Calf #4 of the season up and available for viewing this morning. Shown in the center of the pic with black #11 mom, #17 First Matriarch in waiting, #15 Second Matriarch in waiting. Calf and Mom look fine. Whew !! All 4 calves of this season visible in this pic. The three from 2 weeks ago in the center and the new one from last night a bit to the left. That makes 4 of the 14 we are expecting this season. Ten more to go. The sooner, the better, before it freezes ! There will probably be two late ones, just like last year. Seems like a lot of weeds. Good thing you don't have an HOA. Nothing like good prairie grass for putting beef on the table. Texas, where we have the death penalty and aren't afraid to use it! Build the wall!! Also, I think what constitutes "weeds" is often in the eye of the beholder. What makes up my lawn in Florida (either St. Augustine Grass or Bahiagrass...I'm not sure which) would be considered by most up in Chicago, where I grew up, to be 'crabgrass'. When I was a child, it was the type of grass that my mom used to make me tear out out of the lawn by hand. Actually in the pic the vast amount of what you see is two flavors of "native grass" .. the blue stem and the tall blue stem. The taller brown "weeds" are the tall blue stem and the short green stuff is the "blue stem" .. and yes this is the primary "stable" of our cattle. 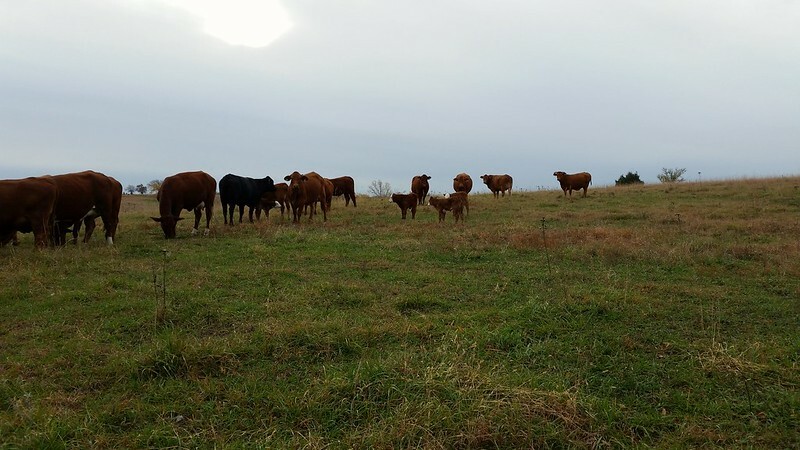 We are very fortunate to still have a lot of green growth in our pastures and with luck, our cattle will be able to eat green grass most of the winter, except in snow or ice conditions, when we will have to put out the bales for them to eat. Husbanding your hay is critical to be able to make it thru bad years. And this actually was a bad year and compared to many around us, we are in great shape. 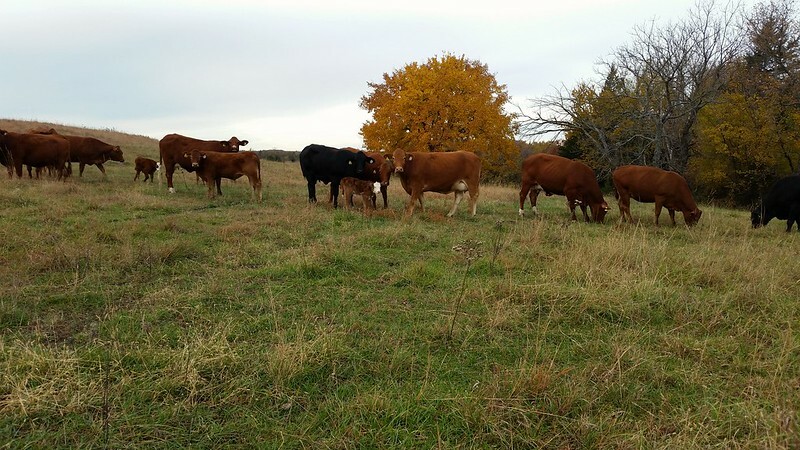 The better condition your pasture, the less hay bales you have to put out and the longer you can sustain yourself through bad conditions. Many pastures around us got emptied out this year during the hot drought. We were fine. On a scale of 1 to 10, our pastures are about a 7-8 .. whereas those around us are 3-6. So we need less bales ... and also have thus been able to accumulate more bales over the past 6 years. GOod bales can last up to 3 years in storage and when we use bales, we generally use the oldest first. wow..3 years? In a barn or just under a tarp? In a barn. Out in the open maybe 2 years. 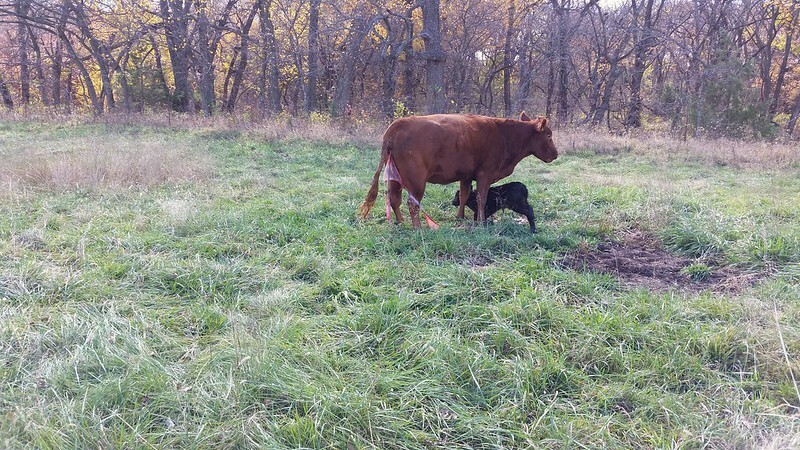 Calf #5 of this season born today. This pic is moments after birth. The calf is still very wet and lots of afterbirth. We have 14 adult females all were pregnant. Five have calved so far. You feel so lucky every time you see a new one. These gals know what they are doing !! This is actually "grandma" who is the matriarch of the group. She is the mom, grandma, greatgrandma, etc. of most of the adult females, maybe all of them.